What do tennis elbow, golfers elbow; jumper’s knee, Achilles pain and rotator cuff injury all have in common? They are conditions or pathologies of tendons that cause us pain and may limit our level of activity. 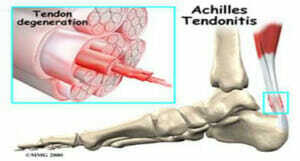 A tendon injury is also known as a tendinopathy, or, pathology of a tendon. This article explains what happens when a tendon is injured. How do tendons get injured and how do tendons recover? To answer those questions it is useful to know about tendon (micro) anatomy and physiology. Having a creative imagination will help here. Essentially a tendon is the end of a muscle which connects the muscle to the bone. If you were to look at a tendon microscopically it would look like a bag of uncooked spaghetti surrounded by jelly. The spaghetti is the collagen, the building block of a tendon and the jelly is the matrix that feeds the collagen. As you load a tendon, the spaghetti/collagen gets bigger and stronger to cope with the forces you put through it. It’s very similar to muscles that get stronger the more you exercise them, although the tendon does not enlarge as much as a muscle would (that would look quite strange)! Tendons in general are very sensitive structures. They are sensitive to the loads and forces we put through them. Imagine little feelers attached to the collagen fibres swaying in the jelly like matrix. They pick up information about what is going on in the outside world and relaying it to the tendon so that it knows how to respond. As an example – If you spend 30 minutes in the gym working on upper body strength, the feelers in your rotator cuff tendons of your shoulders will respond that night to tell your collagen fibres to get more protein to make them bigger and stronger as they may need to repeat this activity in the near future. The process takes 24-72 hours and is a normal healthy response which you may feel the next morning a ‘good – post – exercise- ache’. However imagine if you haven’t been to the gym for the whole summer and you decide you need to buff up your body quickly for an end of season beach holiday, so you go to the gym for 2 hours (and expect to do the same thing every day for the next two weeks). This may cause ‘overloading’ problems. The next morning you may wake up with a greater than usual post exercise pain. In this scenario in the tendons have gone onto red alert and instead of sending messages to your collagen to get bigger they send messages to the matrix (jelly) to swell up, quickly, because this is an emergency! More force is potentially coming their way and they have no time to wait for collagen to build; they need quick results. Swelling in the matrix makes the tendon temporarily bigger and stronger. However this is not a good long term strategy and if there is no recovery period and this process persists, the cells in the swollen matrix degrade the collagen. The collagen fibres start to split and crumble and lose their parallel formation and ultimately the tendon loses strength. It can no longer cope with the forces required to perform the sport or exercise you need to perform and can be very painful. In summary tendons are sensitive to sudden changes of forces. Usually they can recover over a few days but if the force is repeated too soon and too often, degradation occurs. How do injured tendons recover? The simplest answer is relative rest. The worst thing you can do to tendons is complete rest as the collagen will shrink further, causing more weakness and pain and a vicious cycle ensues. Relative rest means stop doing the sport or activity which now causes pain, but remain otherwise active and do the exercises that your Physiotherapist will prescribe, specific to the injured tendon. These exercises will over a course of a few weeks be progressed in difficulty until you can gradually introduce your sport or activity again. Your Physiotherapist and GP/Consultant can help with pain relief therapy or medication or injections alongside the rehabilitation programme. How can you prevent tendon injury? Remember that tendons are sensitive structures they therefore need a gradual increase of load through them. This is why when you train for a marathon you should gradually increase your distance and speed over a period of weeks. Tendons take from 24 – 72 hours to adapt and recover after intense exercise . Respect this. Take rest days. Do strength work using weights or body weight in between the days when you do your sport. If you have overdone it on the strength work you will know by the severity of the pain within 24 hours. Let this recover and repeat strength work at lower loads. This is a fine tuning process requiring some trial and error. If you have injured yourself, rest and pain relief alone are not enough to be deemed healed. If you do not strengthen the specific tendon and its respective muscle, the chances of re-injuring the same area are increased. Control the amount of body fat – high levels of fat cells in the body increase the risk of tendonopathies. Women that are postmenopausal have a higher risk of tendinopathy. Keeping strong will help prevent and manage these injuries.
. . . and finally Sleep is the most powerful anti-oxidant, as per the Pittsburg Sleep Index – make sure you get enough of it! Article written by Karen Korber, Chartered Physiotherapist.